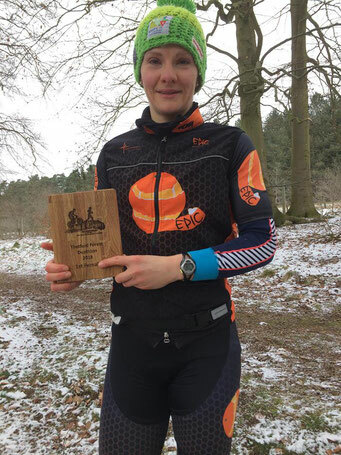 Sunday 18th was a double header for the EpicOrange / Physio Resolutions team, team sponsor Becky Schofield (Physio Resolutions) would be racing the Thetford MTB Duathlon event whilst some of the team were racing Round 2 of the Mud Sweat & Gears Eastern Regional XC at Henham Park. With the 'mini beast from the East' at play it was set to be a chilling cold day for all concerned. Rocking up at Henham Park bright and early Daza, Jodie and Nicole set up team camp. The ground conditions were good but with a strong and bitterly cold wind across the arena the team gazebo would be used by many throughout the morning as much needed shelter. The team had no fear of hiding away in the van while others huddled inside the gazebo pre-race. A quick course reckie early on and it was looking like being a fast and dry lap. The temperature was -0.5 degrees and the wind chill meant conditions on the starting grid were cold, very cold. Jodie and Nicole lined up on the grid and handed over jackets to Daza just minutes before that start, even then the conditions would prove tough going on the hands, legs and lungs. Both got off to a good strong start, with Nicole following Jodie up the first climb and onto the draggy grass plateau that awaited the riders at the top of the hill. It was a tough race for all concerned, Jodie after a week off the bike (but solid gym sessions) came through after 1 lap in 2nd position with 3rd place Allison Good (Gun Velo) close behind, Nicole some 30 seconds back in 4th. Well done to Jodie for another podium, this time in 3rd place. 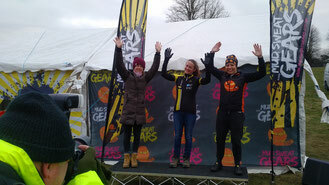 Congratulations to Sally Watts (1-Eleven Racing) and Alison Goss (Team Gun Velo) for 1st and 2nd in what was extremely tough conditions due to the cold winds. Nicole, after a crash early on finished some way back in 4th position but managed to complete the full race distance. 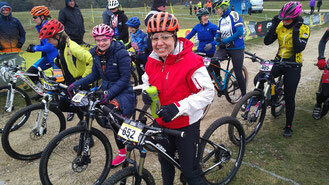 Meanwhile at Thetford, Becky had set out on her race at the Mud & Mayhem off road duathlon with a 5k Run, followed by an 18k MTB Bike race and another 5k run to finish. After racking her KTM bike she was ready to take to the start. 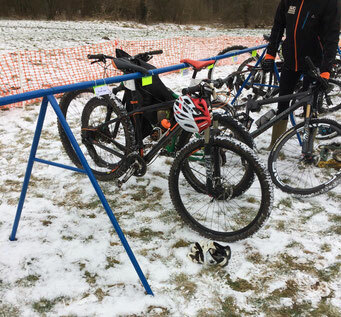 Conditions at Thetford were equally as tough as at Henham Park, if not worse due to a nice settling of snow throughout the whole course. Read Becky's race report below. This was my first race of the year after a less than ideal block of winter training. An accident (on roller skates!) meant no training for 6 weeks (aside from swimming with a pull buoy). I was pretty excited to race again but the subzero temperature and snow made the conditions testing. I had a solid but not quick first run which took me into the lead ladies spot. The bike felt slow and I thought I’d get caught but only one man came through. The only testing part was a bomb hole which to be honest if I was on a training ride I’d properly have bottled! Nice bit of race adrenaline pushed me through it twice and I was absolutely fine! Coming into transition I could see that I had company not too far behind. The confidence from the first run I knew i was capable of staying ahead. Into the finish with an uneventful and pleasing win. Congratulations to Becky for an awesome first win of the season, no doubt the first of many! 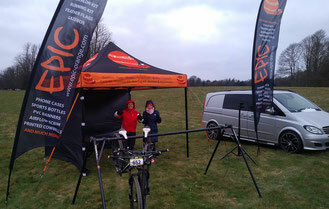 Back at Henham our two young riders Alex and Joseph Stanford were racing in the Under 9's and Under 12's. Joseph took great pride in telling Daza that today he was going for the win (after his 2nd place at round 1). Like his elder borther, he certainly follows in his Dad's (Glen Stanford) footsteps and went off like a rocket from the starting gun, taking a lead that would give him his first ever race win. So proud of his little chap, congratulations Joseph! Alex also had a strong race, coming in 8th overall in the under 12's category. 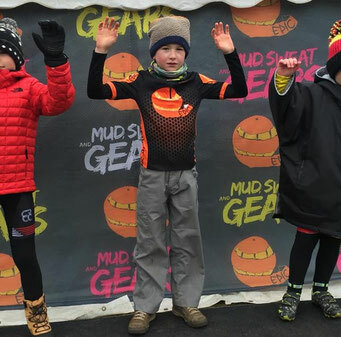 Due to a cold, Glenn wasn't racing and Matt couldn't (initially) make the race so Daza decided to pack up camp early instead of keeping the Ladies back for another 4-5 hours just to watch him 'cough' race later that day. Turned out Matt managed to make it, so did Grand Veteran of the team Rob Hernstrom. Both riders took the grid for the 2pm race with Matt finishing 7th position in the Elite/Expert category and Rob 22nd in the Grand Vets - well done chaps! So another great weekend's racing from the Epic Orange / Physio Resolutions team, with two race wins and one 3rd place podium. Thanks as always go to Physio Resolutions and KTM Bike Industries for their support of the team.